This PMR study on insulation paints and coatings offers an eight-year forecast for the global Insulation Paints and Coatings market between 2018 and 2026. The insulation paints and coatings market study considers 2016 as the base year with market values estimated for the year 2017 and forecast developed for the duration 2018 to 2026. Compound Average Growth Rate (CAGR) for the insulation paints and coatings market study is represented from 2016 to 2026. The insulation paints and coatings market study covers various perspectives of the market, including market dynamics, value chain, pricing analysis, competition analysis, regional and segmental growth comparison and macro-economic and industry growth analysis, along with segment level projections in a comprehensive manner. 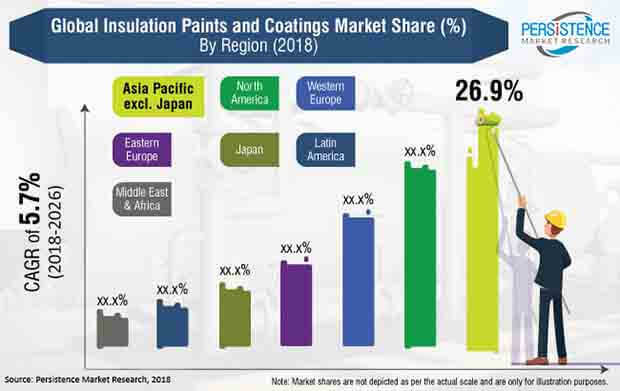 As per the findings of the study and perspectives of industry participants, the global Insulation Paints and Coatings market is projected to grow at a CAGR of 5.7% between 2018 and 2026, in terms of value. Growing environmental concerns, supportive policy frameworks and reasonable cost of operations are some of the factors positively impacting the uptake of Insulation Paints and Coatings in the global market. Insulation Paints and Coatings are products that provide the additional function of thermal insulation while being applied as just any other paint or coating. Insulation paints and coatings help improve energy efficiency of buildings by helping maintain temperature balance within closed environments. Insulation paints and coatings shield the inner parts of the building by blocking heat transfer from outside environment, thereby reducing cooling requirements and lowering energy consumption. The Persistence Market Research report on Insulation Paints and Coatings carefully analyses the market at a global and regional level through market segmentation on the basis of key parameters, such as type, base type, end users and region. The insulation paints and coatings market report is structured to facilitate the reader to develop a thorough understanding of the market. The insulation paints and coatings report begins with market definitions, which are followed by the market background, market dynamics and market analysis by key segments, regional analysis and competition landscape. Each section of the insulation paints and coatings report covers a qualitative and quantitative assessment of the market on the basis of facts, historical developments and key opinions collected from industry participants through dedicated interviews and trends in the market. The insulation paints and coatings report begins with a market introduction, which defines the market taxonomy and product definitions with respect to the global insulation paints and coatings market assessment. In the next section, the insulation paints and coatings report describes the market development background, covering macro-economic factors, industry factors affecting the Insulation Paints and Coatings market for the base year considered for the study. The next section of the insulation paints and coatings report discusses market dynamics, such as drivers (supply and demand side), restraints and trends impacting the market growth at a global level. This section also includes the impact assessment of market dynamics on the global Insulation Paints and Coatings market at a qualitative level based on analysis facts and insights. Subsequent sections of the insulation paints and coatings report provide value (US$ Mn) and volume (New Sales in Kilo Tons) projections for the Insulation Paints and Coatings market on the basis of the aforementioned segments at a global level. The next section of the report presents a summarised view of the global Insulation Paints and Coatings market based on seven prominent regions considered in the study. All the above sections evaluate the present insulation paints and coatings market scenario and growth prospects in the global Insulation Paints and Coatings market while the forecast presented in the sections assesses the market size in terms of volume and value. In addition, it is imperative to note that, in an ever-fluctuating global economy, we not only conduct forecasts in terms of CAGR, but also analyse the market on the basis of key parameters such as Year-on-Year (Y-o-Y) growth to understand the predictability of the Insulation Paints and Coatings market and identify the right opportunities available. Another key feature of this insulation paints and coatings report is the analysis of all key segments in the Insulation Paints and Coatings market, sub-segments and the regional adoption and revenue forecast in terms of absolute dollar opportunity. This is traditionally overlooked while forecasting the market; however, the absolute dollar opportunity is critical in assessing the level of opportunity that a provider can look to achieve, as well as to identify potential resources from a sales and delivery perspective in the Insulation Paints and Coatings market. In order to understand the key market segments in terms of growth and installation of Insulation Paints and Coatings across concerned regions, Persistence Market Research has developed the attractiveness index, which will help providers to identify real market opportunities. In the final section of the insulation paints and coatings report, a competitive landscape of the Insulation Paints and Coatings market has been included to provide report audiences with a dashboard view, categorised on the basis of providers present in the value chain, their presence in the Insulation Paints and Coatings market and key differentiating factors and strategies. The primary category of providers covered in the report includes insulation paints and coatings manufacturers. This section in the insulation paints and coatings market report is primarily designed to provide clients with an objective and detailed comparative assessment of the key providers specific to a market segment in the value chain of the Insulation Paints and Coatings market. Examples of some of the key competitors covered in this report include Akzo Nobel N.V., PPG Industries, Inc., The Sherwin-Williams Company, Nippon Paint Holdings Co., Ltd., Kansai Paint Co. Ltd, Jotun Group, Hy-Tech Thermal Solutions, Highland International, Okitsumo Inc., Nissin Sangyo Co.,Ltd. On 16th June 2017, PPG Industries opened a US$ 49 Million paints and coatings production site in the Lipetsk region of Russia. Also, in April 2017, the company introduced a US$ 3 Million production facility for packaging coatings in Oak Creek, Wisconsin, U.S. Some of the prominent players covered in this market study on the global insulation paints and coatings market include Akzo Nobel N.V., PPG Industries Inc., The Sherwin-Williams Company, Nippon Paint Holdings Co. Ltd., Kansai Paint Co. Ltd, Jotun Group, Hy-Tech Thermal Solutions, Highland International, Okitsumo Inc. and Nissin Sangyo Co. Ltd, apart from the various regional players in each of the market geographies. How has the insulation paints and coatings market evolved over the past four years? What shape is the insulation paints and coatings market expected to take in terms of volume and value during the study period? What are some of the prevailing market dynamics in the insulation paints and coatings market? What are the competition developments and trends in the insulation paints and coatings market? What are some of the underlying macro-economic and industry factors impacting the growth of the insulation paints and coatings market? How the competition is structured at present and how has it evolved in the insulation paints and coatings market over the past few years? Thermilate Roof and Wall Coatings Ltd.
Prolat S. Dimopoulos & Co. E.E.